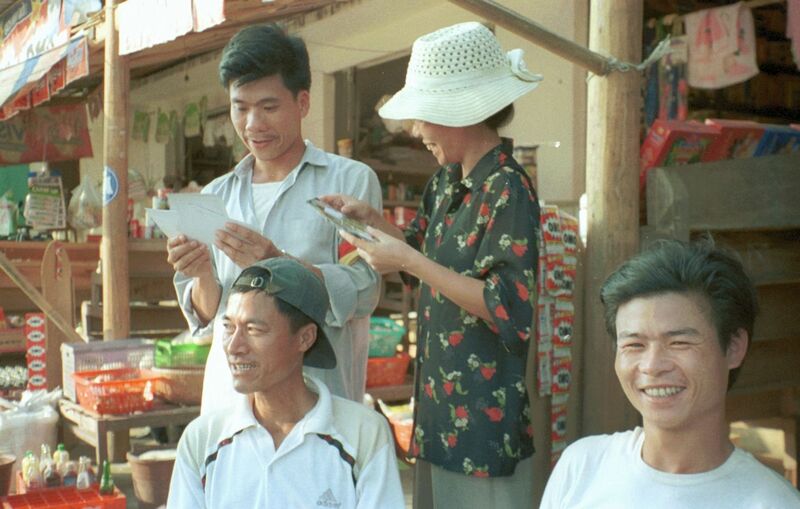 In February of 1999 we decided to go to Vietnam in April. Blocked in by business obligations, we had only 13 days for the trip. Then, because we couldn't get a direct flight to Ha Noi, we decided to connect through Bangkok. Given that, we further decided to spend three days at the Oriental Hotel on the way back to guarantee us some real relaxation time. That left us with just eight days in Vietnam. 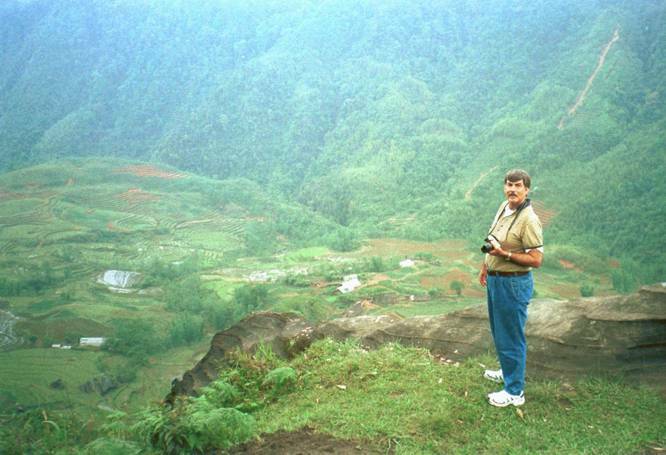 It quickly became apparent that we could not satisfactorily do all of Vietnam on one trip, in deference to the many tours who tell you they can do this. This is because of the distances involved north to south. While the country is less than 50 miles wide at it's narrowest it is upwards of 1,300 miles long. The train ride from Ha Noi in the north to Saigon in the south has recently been shortened to 32 hours; it's a long way. First off, let me say that this was one of the most interesting trips we have ever taken. Scenery was beautiful, food was great, everybody was more than friendly, things were cheap and people loved the U.S. We were told on different occasions that there were two great countries; the U.S. was number one and Vietnam number two. The war, it seems, for the majority of people was only a bad memory; kind of like it was nothing personal. The Chinese invasion of 1979, on the other hand, left a lot of bad feelings. I set the tour up with a tour operator out of Ha Noi, because we were very late in booking the trip, and they took care of every leg of our travels within Vietnam including pickup and delivery. What we wanted was a driver and guide. We also strongly suggest that you arrange to have yourself picked up at the airport when you arrive. It is so nice to walk out amid the chaos of a big airport and see somebody holding a sign with your name on it. It solves a multitude of anxiety producing problems for a first visit to a country in which you can't read the writing and particularly in a third world country. Speaking of the language, we usually try to at least learn a few words to help us get by; not here. Living in Japan, we've learned to speak with little to no intonation. In Vietnam intonation is an integral part of the language; one word can have six different meanings depending upon how you say it. Also, the 'thumbs-up' gesture is universally accepted as something akin to 'ok' or 'good.' Do not use the 'ok' sign. The tour operator also set up our excursion on a train to Sa Pa. A driver would pick us up at the hotel and deliver us to the train the day after we arrived. 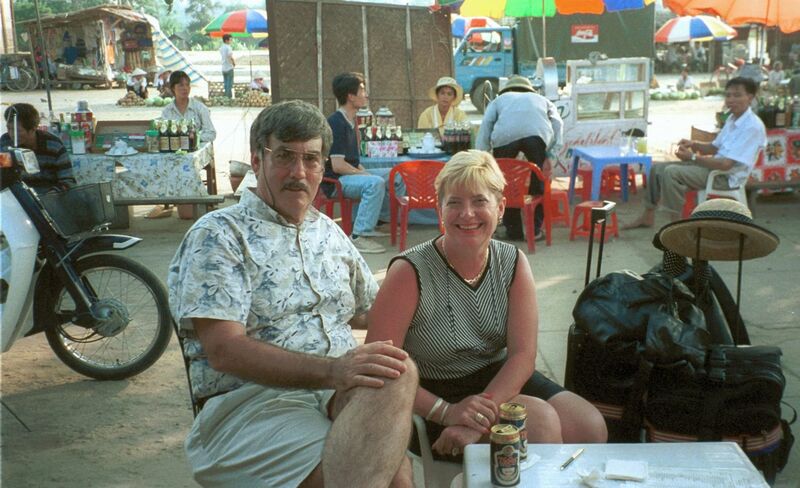 Then, two days later, he would pick us up at the train station and deliver us to Ha Long Bay for our boat ride. He also set us up as the only passengers on the boat and booked the hotel at Ha Long Bay. And, the next afternoon, the driver would pick us up at the hotel and drive us back to Hanoi. I took care of the hotel in Hanoi. And, if we had booked earlier, I could probably have taken care of the other hotels also. Arrival in Ha Noi was uneventful and we took a tour of the city that afternoon. The downtown area in Ha Noi is like one huge market. There are shops along most streets selling every conceivable thing and everybody seems to be involved with the running of some shop. However, several things about downtown Ha Noi soon strike you as a little unusual. First, is the lack of cars and second is the lack of pedestrians. Just about everybody gets around on a scooter or a bicycle. Indeed, there are some 3.5 million people, some one million scooters and probably more bicycles. 'The next thing you notice is the constant honking. Because the roads are clogged with traffic, anybody wanting to go faster than somebody else honks their horn and pulls around; this is particularly true of a car wanting to go by. Roads are not for cars; roads are for people and everybody feels that the space they are in is theirs and only reluctantly will give ground. Rights-of-ways are negotiated constantly after getting someone's attention with your horn. Scooters and bicycles routinely cross intersections without looking for cross traffic. And there are few signals. The end result is constant and cacophonous flow of vehicles up and down streets. The nightmare for Vietnam will come soon as affluence allows the people to switch from scooters to cars, as happened in Beijing. At least for now, unlike Beijing, you have a fighting chance in crossing a street. We've been in noisy cities before, but nothing like Ha Noi. And, it's not much better anywhere else in Vietnam; everybody honks constantly. 'There are also virtually no animals around; no cats, no dogs, no pigeons, no nothing. Which brings up another interesting point. In Ha Noi, vis-a-vis the rest of Vietnam, dog is a delicacy; indeed you see them roasted for sale in the markets like we would sell chicken. And, no, at least to the best of our knowledge we never tried dog; as if we'd tell you if we did. As far as cats go, someone told us that cats aren't good for anything. We have our own view of where the other small animals and birds have gone. Anyway, there were not many westerners as you might expect. Among those, the French are clearly the dominant group. The dominant Asian tourists seemed to be Chinese with Japanese tourism way off. Coincidentally, the Chinese seem to be as well liked in Vietnam as the French are in Europe, which means not much. However, we found the Chinese to be very friendly on the occasions that we ran into them. Now, in Ha Noi you have several basic forms of transportation; you can walk, of course, and in fact the downtown was very accessible by foot. However, it is slow going. First, you have to thread your way between the people standing around in front of the shops along with their scooters and bikes parked every which way and the traffic moving just outside of this domain. And then there was a multitude of children selling postcards and other stuff you must constantly fend off. Actually some are quite engaging and Mike had bought four packs of 10 from different vendors in the one day before we left the city. There were, however, very few panhandlers along the streets. There are also taxis. But for the adventurous there are cyclos; a peddle powered rickshaw. They used to be everywhere but because of the explosion of scooters, they are now pretty much limited to hotel guests. 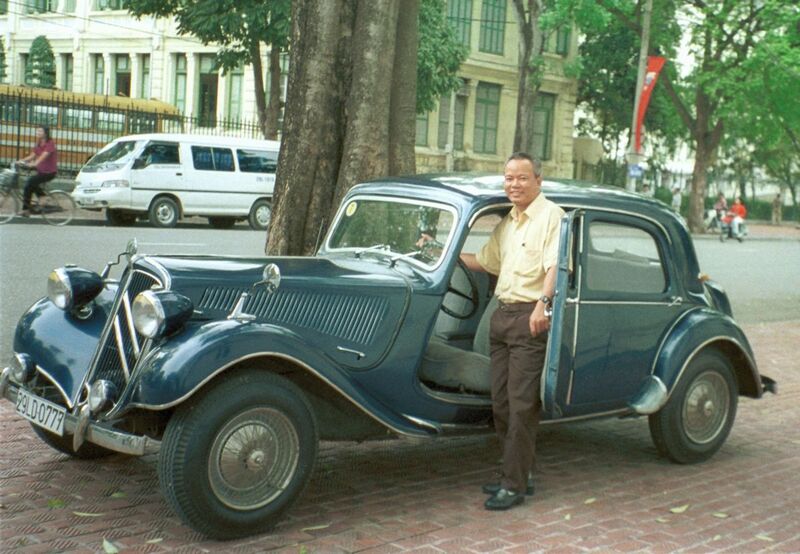 Because we had an agenda-to see a number of art galleries and made-to-order clothing shops-we opted to be driven around in the hotel's 1939 Citroen. For about $25 this guy spent nearly three hours driving us to various shops. Of course, driving at about 15 miles an hour it took us a while to get around. And, needless to say, we drew a lot of attention. But Kath did find a great place for clothing and for about $60 got a made-to-order silk suit including skirt and pants. We also found an abundance of art. Unfortunately, the market is dominated by abstract works; clearly there are a number of people with no talent trying to make a living selling paintings to people with no taste. That pretty much wrapped up the second day. Lao Cai, in the northwest, is a major border crossing into China and where the train from Ha Noi ends up. 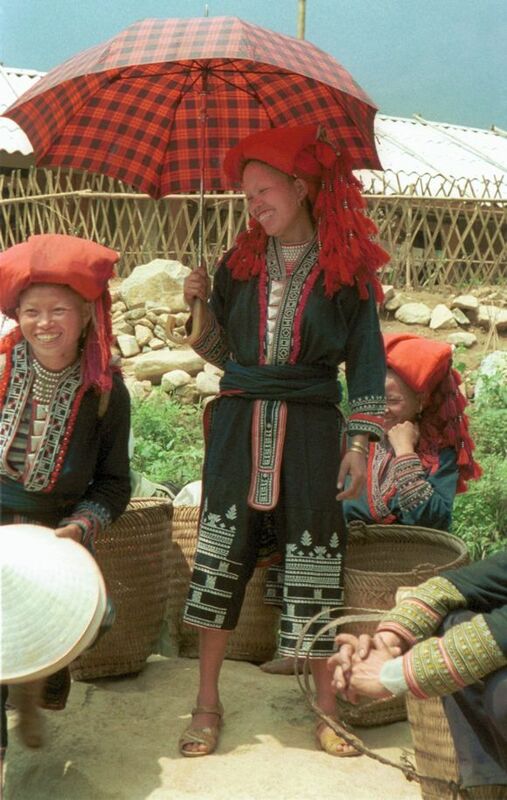 Sa Pa, a village up near Lao Cai, is noted as the place to go to see the minorities; the tribes people of north Vietnam. 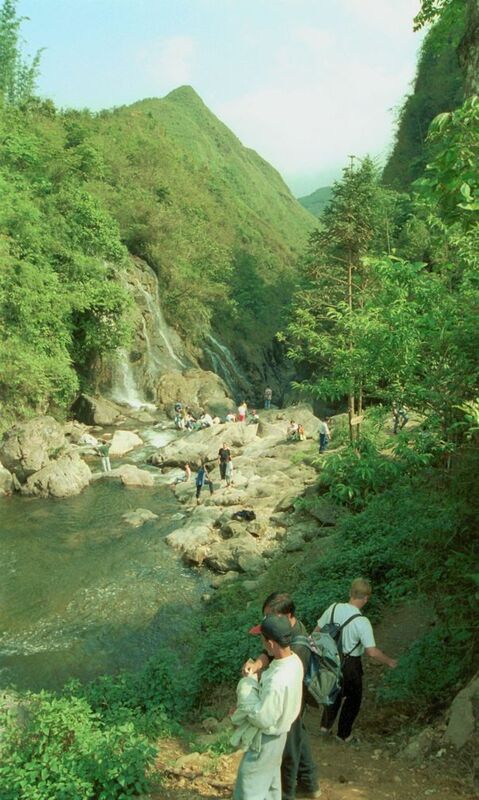 And Sa Pa was also rated as a must-see place by the travel books. Unfortunately, Sa Pa is only accessible from Ha Noi by two basic ways; a 10 hour overnight train ride or a 240 mile jeep ride over marginal roads. Because the three sleeper cars on the train were initially unavailable, I actually gave the jeep ride some thought. Fortunately, the Victoria Hotel in Sa Pa, which owns the sleeper cars, had a package deal which we got into. You have to realize that the train ride is some 10 hours long. The uninitiated and the backpacking set don't stay at the Victoria Hotel and thus do not have access to the sleeper cars. This means that they will try to get some sleep in the seats on the other cars on the train. Did I also mention that the sleeper cars are air-conditioned? Friends of ours who recently took this trip said that they were constantly pestered by those in the other cars trying to get our friends to let them sleep on the two unused beds in their compartment. Whether you let people share your room is entirely up to you. To back up a second, here was the trip so far. On Tuesday, April 27th, we took a flight from Tokyo to Bangkok leaving at 7:30 p.m. and it was 1:00 a.m. before we got to sleep. We were then up again at 5:00 a.m. to catch the 8:30 flight to Hanoi. We arrived in Ha Noi, had lunch and took a guided city tour. That night we got a good sleep at the hotel. After our shopping trip around the city the next day we checked out of the hotel at 4:00 p.m. and were picked up for the train ride at 8:30 by our tour operator. The train left at 9:30 p.m. for Lao Cai, from where we would be driven to Sa Pa. Never a dull moment, as they say. I should note that the last time we covered any distance on a train was a 14 hour marathon from S.F. to L.A., at which time we said we'd never travel any long distance by train again. However, the train ride out to Lao Cai was actually a kick. Thank God we had a guide to take us to the station because we found chaos when we arrived there. Our driver finally told us to just get out and walk to the station because he simply could not get through the people. Finding our train cars without the guide's help would have been more than a daunting task. We had two roommates in our sleeper car, who turned out to be the only other Americans at the hotel. Coincidentally, they both lived in Tokyo, just a short distance from where we lived. Anyway, we finally arrived in Lao Cai at 7:30 in the morning. We then took a 90 minute ride in a min-bus to the hotel in Sa Pa. To say our driver was cautious, or that we appreciated his caution, would be an understatement. He never went faster than about 30 mph while rising about 4,000 feet on 19 miles of two-lane mountain roads that make even Philadelphia's pot-holed secondary roads look good. 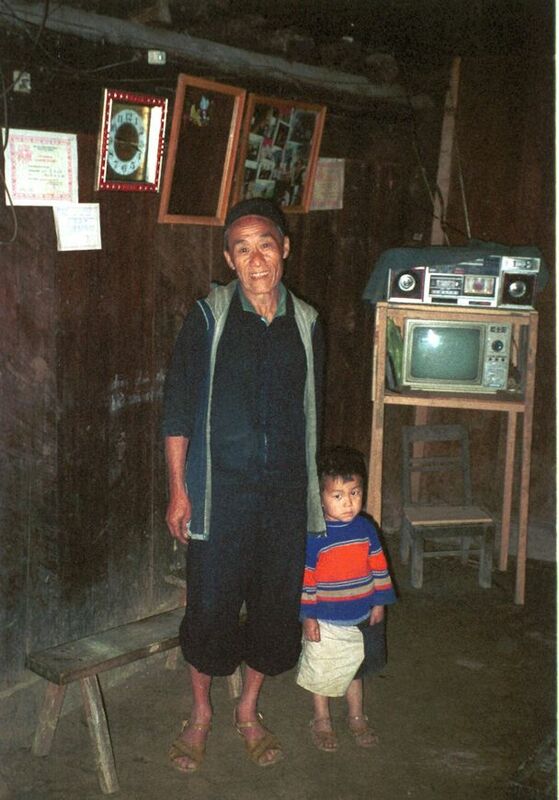 Sa Pa is a small village with little other purpose than to serve the tourists who come to see the mountain people. To say it was a quaint little town would be a stretch. However, the Victoria hotel was a delight with pleasant rooms and excellent food. There were probably 20 families staying there, of a variety of nationalities but mostly French. After checking into the hotel and having breakfast, we were picked up by our guide. As usual, we didn't want to go where tourists normally went. So we opted for a guided 'soft trek' to the villages. Now my sense of a soft trek was an easy walk. It soon became clear that the guide was going to make us suffer for what we did to them in the war. An hour later we had walked about a mile from the hotel while dropping down an ever steeper slop until we came to a really steep trail that would take us to the village below; another 1,000 feet down a narrow path. This was hiking boot stuff. Fortunately, I had on tennis shoes. Unfortunately, Kath only had walking sandals and was having a little trouble. It was also apparent that they used this trail to move their water buffalo and missteps were not only slippery but smelly. Daunting as the trail was, the vista that was opening up on the valley below was beautiful. As we came down the trail you could see smoke rising from the houses sitting along a small river, hear the sounds of children and see the cultivated rice paddies spreading out below us. It was as beautiful as it sounds. And we soon met several young girls hauling logs up the hill, to sell at the market in Sa Pa. It was never made clear why people were buying these. 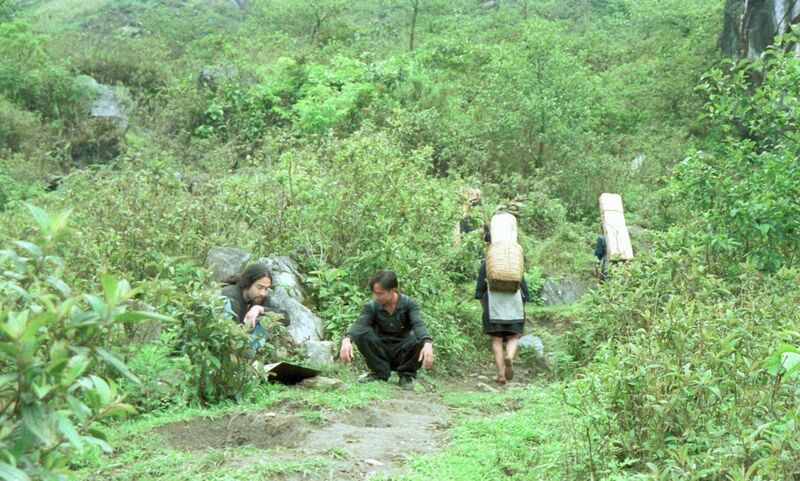 But hauling them up the hill seemed like no great burden to them in deference to our struggles just to go down the path. Anyway, as soon as I pulled out my camera it became apparent that they did not want their pictures taken; a common reaction the entire time in Sa Pa. I asked the guide to ask them if I could take their picture and they said absolutely not. Something about people-i.e. tourists-leaving with their image. However, I didn't travel all this way not to get pictures of the local villagers. So we began the negotiation process. Kath always had candy with her and we would offer that to them while the guide continued to cajole them into one quick picture. And we would try to get them in a picture with the guide or with several of them together. Sometimes it would work and some of them would eventually let us take their picture. And, if we could get one to do it, the others would often follow. Just before our Bhutan trip I switched from the film-based Canon I used on this trip to their digital camera. What I found using that camera was that taking a picture of whoever would let me and then showing them the picture in the view screen made everybody a ham. Getting pictures after that was easy. I only wish I had had the digital camera on this trip. Further down the trail, where most of the regular tourists went, many of the children would hold out their hand as soon as you'd take out the camera and say, 'you pay.' We were advised here, and similarly on other trips, that paying just encourages begging and is strongly discouraged by the locals. 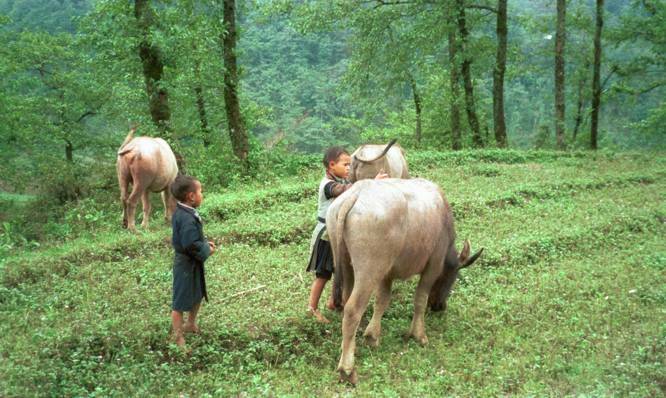 Indeed, in Bhutan, the tour guide would not even let us offer candy to the children. It was against government policy. Actually, all of the villagers we met were friendly and would usually return our 'hello' with a smile and often a 'hello' of their own. Even the dour looking men working along the road would smile when we'd say 'hello' and nod to them. While the children were camera shy, they were nonetheless fascinated by us. Kids at every village down the valley would all come over to see us and then follow us until we left their village. It seemed that everybody but the small children and the elderly worked. All the men could be seen up the slops in the rice paddies, usually working with the water buffalos. Most of the market buying and selling was done by the women and there was a constant coming and going to the market in Sa Pa. Some of the younger girls worked the fields planting or tending the corn, which they had planted on much of the slops too steep for rice paddies. Actually, there was far more corn being grown all over Vietnam than we would have expected. There were also water buffalo everywhere, either grazing or working. Now this is one big animal, at least as big as your average cow, with huge horns. And most of those we saw grazing were being tended by children looking no older then 10. We were never quite sure how they got this animal up onto the slopes and into and out of the paddies but these were clearly their tractors. So, when we came through the villages, most of those we saw were older women who were tending the children and real young children probably up to six or seven years old. As it was explained to us, few went to school for any length of time. Although the government would pay them to go to school, the villagers would only do it for a few years for the money. The guide would talk to the people as we walked down the valley and some invited us into their homes. The children would all gather around and Kath would pull out the candy. And Mike would stand back and try to get pictures of everybody while they were distracted with the candy. We were offered tea and rice wine and the older men, grandfather types we guessed, who were usually sitting in the houses, would offer Mike a smoke on their water pipe, which he politely refused. By the end of the day we had dropped another 500 feet or so down the valley and walked a couple more miles. It was here that we made the BIG mistake. 'Did we want to see Cat Cat falls, a local attraction?' our guide wanted to know, motioning down towards the bottom of the canyon. Now, we had been out in the sun all day, and had drunk some rice wine, and that can be the only reason we decided to hike down this abyss. We surely dropped another 500 feet down to see what was a very unimpressive falls. The problem was, we were now perhaps 1,500 feet below the hotel in this canyon. Needless to say it was a long slow hike back to the hotel. We left the hotel at 11:00 and straggled back around 5:00. For the record, during that time we passed not a single bathroom. Fortunately, the next day's soft trek was a little less rigorous but, unfortunately, no less adventurous. It was also our introduction to the Russian jeep. When I made the travel plans the tour operator clearly distinguished between the 4WD Toyota with air-conditioning and the Russian Jeep with windows you could open. 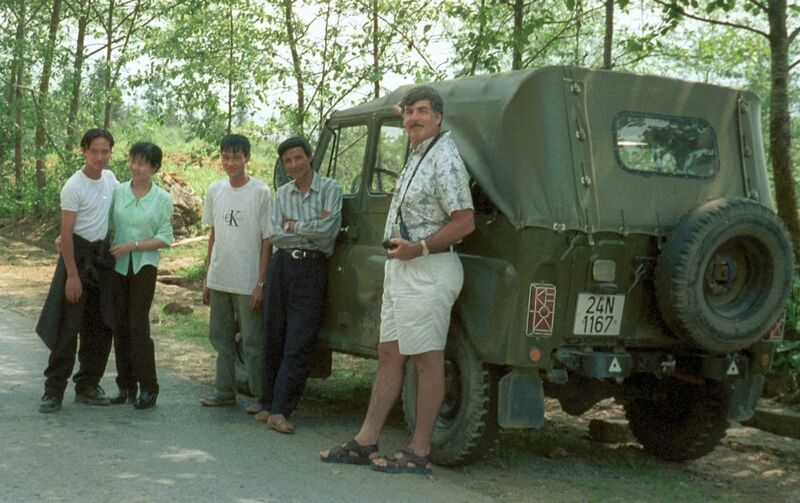 Unfortunately, all that was available to us in Sa Pa was the Russian Jeep. There was not an iota of adornment on this vehicle. It was painted green metal outside and inside. The driver said it was probably 20 years old and during that time everything that wasn't metal, except the seats, had been removed. Anyway, the jeep was to take us to a point above the village where we would start the tour that day and would pick us up later at the last village. I was very clear to the guide that we did not want to walk back to the hotel. We would again drop down into the valley but it was not to be as rigorous getting down or back out. And, as with the prior day, the vista of the valley below with the rice paddies all around was magnificent. Once at the valley floor the guide said we would take the shortcut across the rice paddies to the first village instead of going way around them on the trail. I had a bad feeling about this but the guide was insistent, unless of course we were sissies. Unfortunately, it quickly became apparent why there was a trail around the rice paddies. We spent the next 30 minutes walking along the edge of the paddies, climbing from one to the next up muddy slopes, crossing flowing water either on two pieces of bamboo or over slippery rocks and threading our way along muddy paths between the paddies and the buffalo pies. How we avoided either stepping into a paddy or falling into one is still a mystery to me. I never realized that fear can improve your balance. After that, we continued down the valley as in the prior day visiting with the people as we went. This guide, however, a different one than the prior day, was well known in the villages and had a much better rapport with the villagers. At one of the villages, which was a Catholic parish, he got four young girls to sing for us and do a little dance. And he made getting pictures of the dozen children who had joined us a lot easier. But we still went through a lot of candy. One of the concessions made to get pictures was that we would send back copies of the prints to the village people; a small expense for the many great pictures we got. 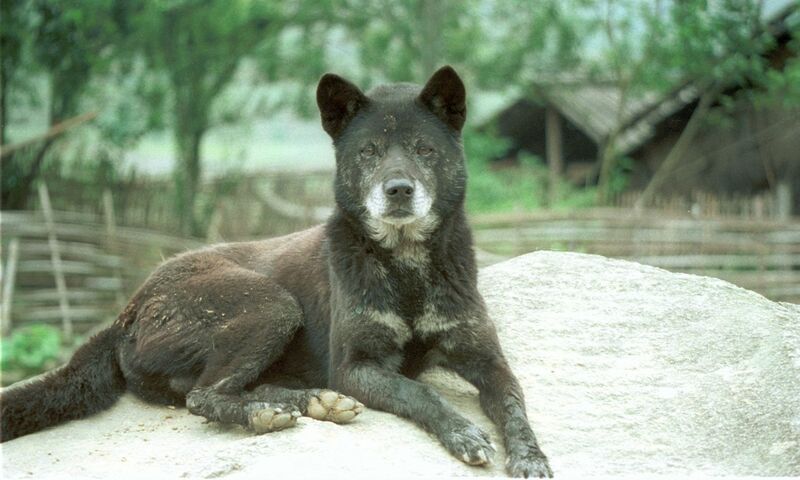 Every village had dogs, kind of like a small husky. And everyone of them growled at us. They were also raising pigs, ducks and chickens which generally had free run of the village. 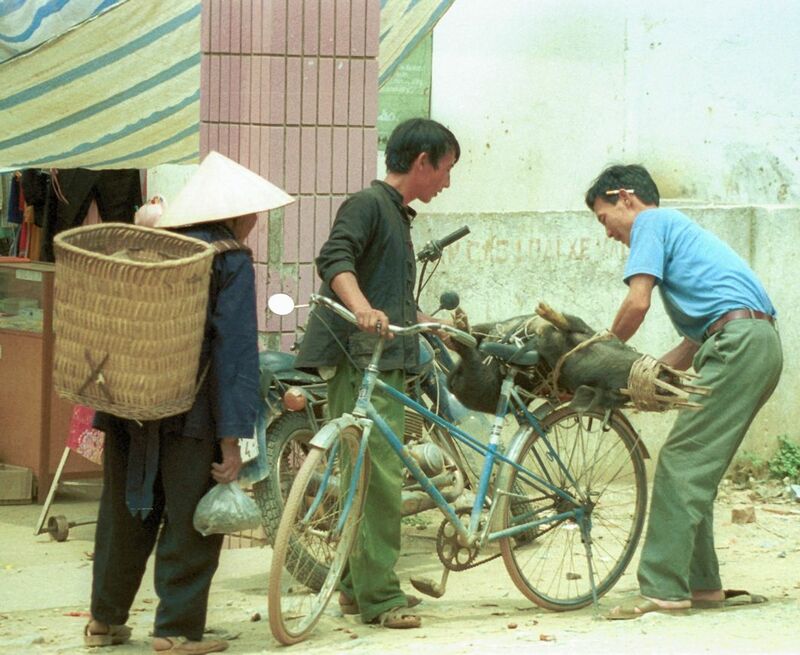 Indeed, the chickens, many with half a dozen or more chicks, were everywhere in North Vietnam including on the roads. It turned out that the animals were their cash crop; the people lived on the vegetables and sold the animals. The animals also explained why there was so much corn. The inside of their houses were all pretty much alike. Mostly wood siding, sometimes using tin roofing materials, they looked like any typical shack in a poor area. They usually had two basic rooms with dirt floors; one the main living room and the other the kitchen. They nearly all had a loft which was used for holding grain. All of the houses were pretty dark and all smelled of wood smoke. In the kitchen was a big, really big, pan like you would use for stir fry, sitting on the fireplace. Still and all, you never had any sense that the place was dirty or unkempt. 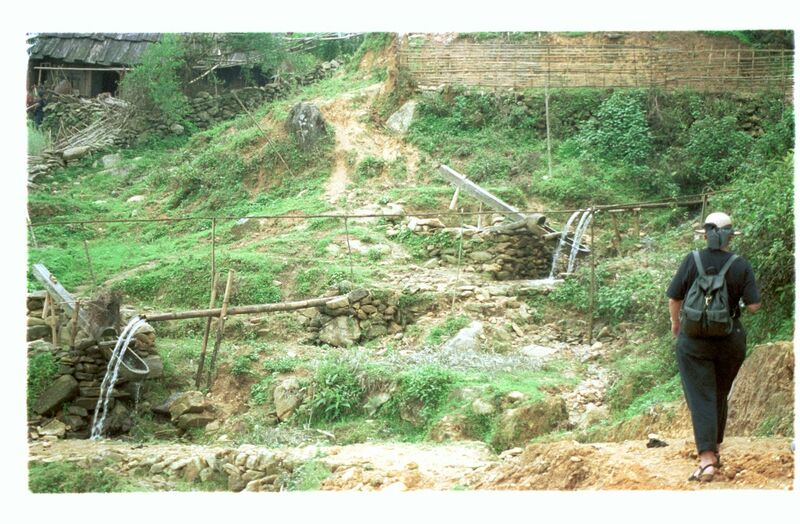 And, given that this area was the coldest place in Vietnam and occasionally got snow, they had to be cold in the winter. In several of the places they brought out chairs for us to sit on. And, we were served tea or rice wine at a little table with the children standing around watching it all. Curiously, some of the houses had electricity. It turned out that they were channeling the falling water coming off the hills into bamboo pipes that eventually turned a little generator at the bottom. This allowed them an electric light and in some cases a radio or a television. After a short walk along the side of the river, it became apparent that the path ahead was going to cross a steep slope along the river; I mean very steep. Here is this trail just wider than my foot-their feet are about half my foot size-and 30 feet below us is a river with big rocks. And it was clear that there was no other way to go. With my left hand supporting me by leaning on the slope on the left-I said it was steep-I just keep putting one foot in front of the other until I got to the other side. Then, just as I was steeping onto a level area, I could see this five foot snake right beside where my foot was going to land. 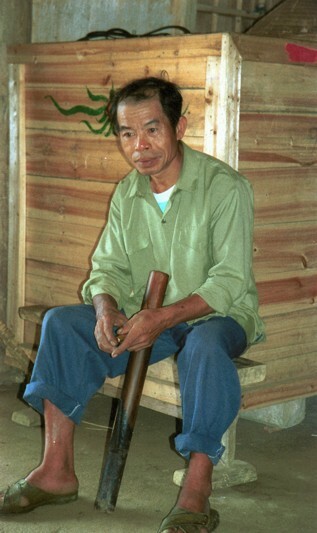 As my foot hit the ground it pulled back into the classic strike position and I froze as my mind tried to recall what I had read about poisonous snakes in Vietnam; mind you I was wearing shorts and it was looking at my leg. For two seconds nobody moved. Then it turned and disappeared into the brush. The guide, who was right behind me, said not to worry, it was not poisonous. The only deadly snake around there is a foot-long snake. Doing an Outward Bound program as part of our vacation was not in the original plans. Making that crossing was about as scary as anything I can remember doing. If you slipped, there was no way you would not go into the river. About half way across I decided that if Kath fell in, I would finish crossing before doing anything about rescuing her. Anyway, that was enough of the short cut for us. We then started up through dry rice paddies to the road some 500 feet above us. As we were finally climbing up on the road, some villagers returning from market asked our guide why the dumb tourists didn't take the road they were on. As he explained the conversation to us he though it was very funny. On heading down to the last village we caught up to a half a dozen village women returning from Sa Pa who had stopped at a little market on the road. And, of course, I just had to have pictures of them. So our guide talked to them and they agreed, much to the amusement of the several men standing around. 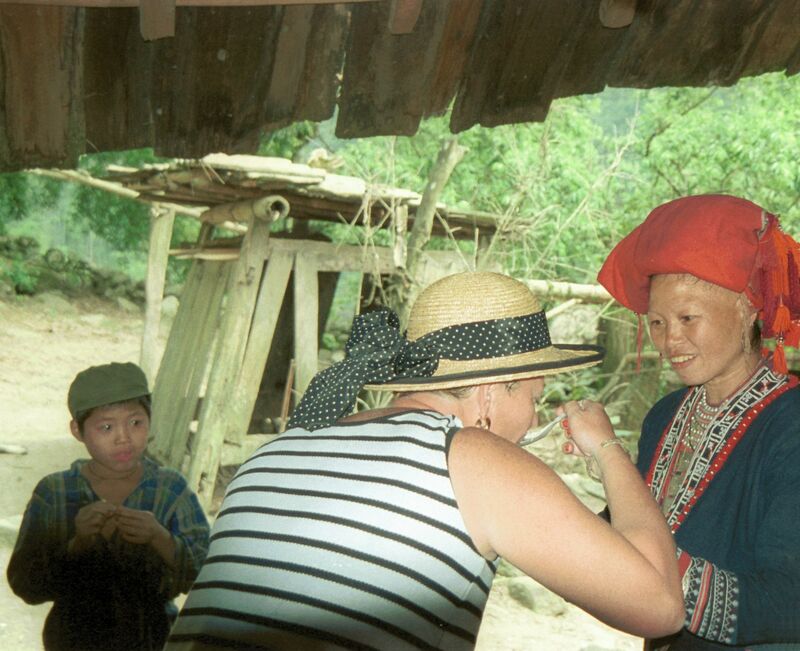 They all had on the silver jewelry commonly worn, but in this village the women worn bright red headgear. And, one of them was sporting a bright red umbrella so it was quite photogenic. One of the men then came up to Mike and put his two hands around Mike's calf and then laughingly compared the girth to his whole leg. On another occasion, one of the men actually petted Mike's (hairy) arm in amazement. It was never dull. Anyway, as we continued on down the path, the guide mentioned that one of the women whose picture we'd taken wanted us to visit her house. Another entertaining experience where we were offered a bowl of fermenting rice wine. We tried one spoonful-it was not a good vintage-and apologized for being too full right after lunch to drink any more. There were other interesting things in Sa Pa but that's the most of it. It did occur to me at one point, admiring the beauty of the area, that we come by and see beauty and all they see when they look out every morning is a lot of hills to climb and work to be done. Our return trip back to the train was no less adventurous. We were picked up at the hotel at 7:30 in the morning for a ride to the market at Bac Ha, another must-do trip according to the tour books. This time, however, we made the drive in the Russian Jeep. The tour operator had assured us that going with their guide, instead of the hotel bus, we would visit some more interesting villages. So, we decided that the adventure should continue. Besides the driver we had our guide and his girl friend, who shared the shotgun seat, and then the driver's helper on the seat next to us. And, as advertised, air conditioning was supplied by opening the wing windows in the back. An hour and a half back to Lao Cai, including a gas stop, then an hour and a half out to the market at Bac Ha. Normally, a gas stop would not be something of interest. But, this was Vietnam. Pulling in we were behind six motor scooters and one Russian jeep, all milling about one pump in a very scattered arrangement. And, we were soon joined by two more Russian jeeps, one of which had to be pushed out of the way before we could leave; we think it ran out of gas waiting. The pump was manned by two girls pumping the gas by means of a hand crank. One of the people on the scooters was buying gas by the cupful. Another guy tried to leave without paying, greatly agitating the pump girl. Fortunately, our driver was very assertive and we got under way quickly. 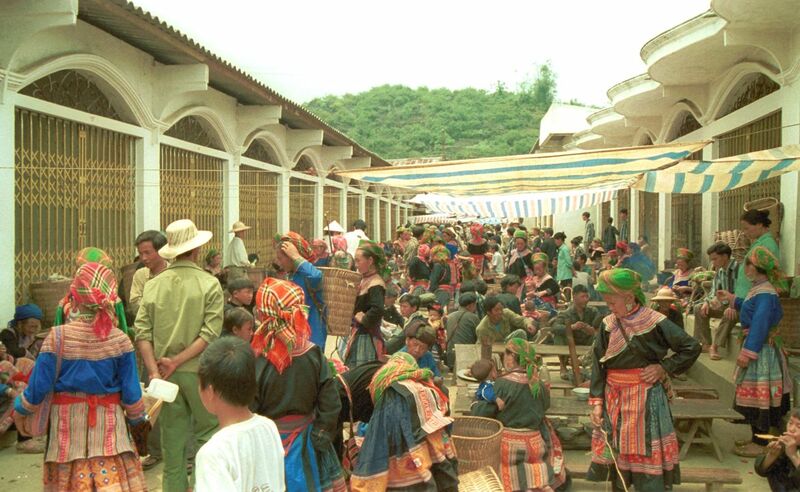 The market at Bac Ha is considered one of the main attractions in the region and even considering the formidable commute to get there, it was worth it; once at least. Now then, to say that we like markets is an understatement; we plan trips around local markets. So, we have seen more than a few. Nonetheless, this one is indeed unique. Covering about half a football field, it is not so big as it is colorful. The outfits worn by the women are spectacular, particularly when you consider that these are mostly farmers. They wear cloths sporting every color of the rainbow in beautifully woven designs and lots of jewelry. Indeed, the younger girls spent a lot of time looking at jewelry and purses and such being sold at the market, no surprise there. Actually, just about all of the women in the villages we saw wore a multitude of silver jewelry. Another popular item with the market goers was a kid of popsicle, often consumed two at a time. It's a real market where just about everything is traded. However, the pigs seem to be the most distressed by it all and make a horrible noise when trussed up for travel by the buyer. There is only a smattering of tourists, all of whom seem to be toting around a fancy camera and trying to be inconspicuous so they can take pictures. However, as you can imagine, it's hard to hide a six foot westerner in shorts amid the colorful tribes people. Finally, we had fried rice and noodles at a local place beside the market. All we had to do was look for where foreigners were eating. Beer was cold, the glasses were dirty, the food was great and the service was haphazard at best. Not bad, all things considered. We spent about three hours at the market, then another hour and a half back to Lao Cai to wait for the train. More entertaining than a ride in a mini-bus with other tourists? Sure. But after five hours of a bone jarring ride in the jeep, a cold beer and then a comfortable sleep on the train was looking very good. After being dropped off at the station, it was quickly apparent that the rest of the hotel people, who opted for the more mundane minibus trip to Bac Ha, were nowhere to be found. As the hotel was setting up the train ride, this was a little disconcerting considering the chaos at Ha Noi. So we decided to sit at a street-side table at a local beer bar next to the train station to await the rest of the people. Looking for something to do for the next two hours, besides drink beer, we decided to write some postcards. But no sooner did we bring out the 40 or so postcards we had brought from Hanoi than the waiter asked if he could look at them. Within minutes we had 10 people standing around looking at the postcards. Seems they had never seen pictures of the local area. Touring in Sa Pa is clearly third-world touring. Roads are bad and often washed out, nobody seems to know what's going on, few speak English, getting to and from trains is not for the faint-hearted, the busses are unimaginably crowded and dirty and the toilet accommodations primitive and infrequent. It is often noted that these areas are first visited by the back-packing set. They are willing to sleep on the floor somewhere, eat with the locals and travel by hitchhiking, bus or train. They usually don't have any pressing agenda so missing connections is no big deal. Then they tell all their friends what's there and how great it is and how to get there, and it gets on the Internet. And the next thing you know they start upgrading the hotel accommodations, they improve the roads, restaurants appear offering good food, and the prices of everything goes up. The back-packers get pissed off at all the tourists and higher prices and start looking for something else. 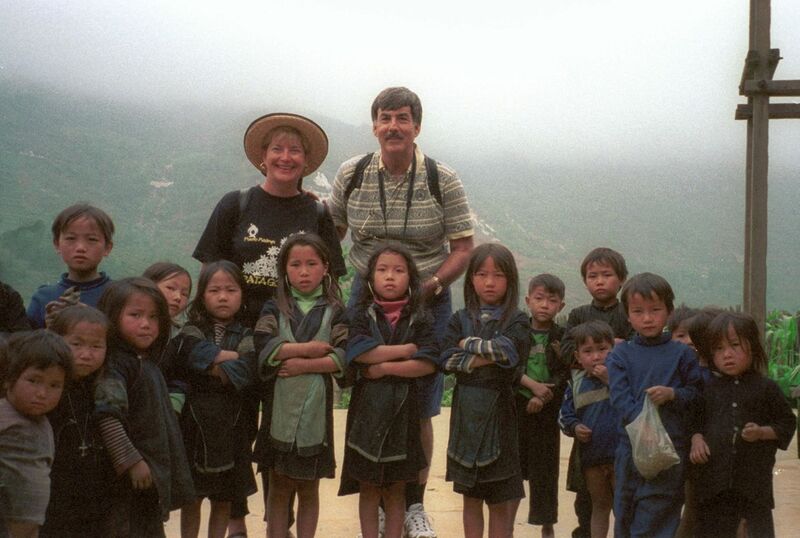 We hit Sa Pa just after the good hotel opened but before much else had changed. This is a not to be missed place. Well, eventually we did manage to find our sleeper car on the train. Then, 10 hours later we were picked up at the Ha Noi train station by our driver for a four hour drive to a hotel in Ha Long bay. After a shower at the hotel we headed back to the docks for a five hour boat tour of the bay. 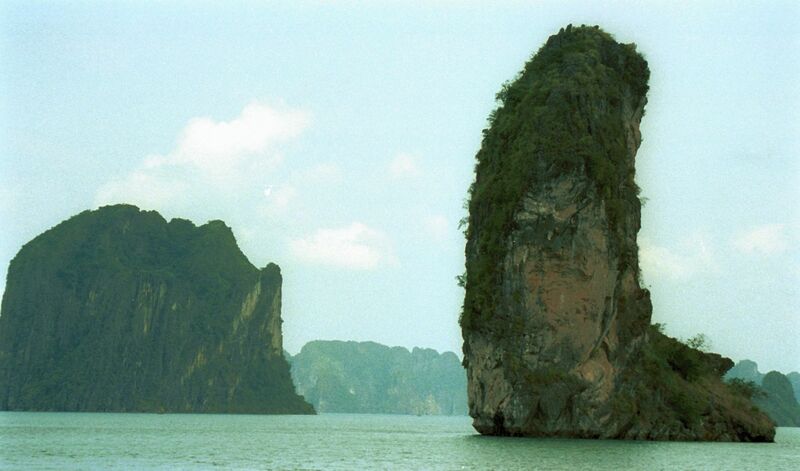 Ha Long Bay is noted for its unusual rock formations and we were not disappointed. All around the bay rocks rise hundreds of feet right out of the water. It is remarkably beautiful and the boat ride remarkable peaceful; I had set this up as a private boat ride and that helped. The boat first stopped at a side tour of a cave filed with the most interesting stalagmites and stalagmites I have ever seen. I haven't been to Carlsbad Caverns so I can't compare them, but this cave was fascinating. Further on into the boat ride we had two young girls row is into a huge grotto within a big rock formation, had a delicious lunch on the boat and then bargained with the cook over postcards, t-shirts, silk table cloths and other stuff she was selling as a sideline. Mike also bought some more postcards. Back again to the hotel for a short nap and then out for dinner. Finally, a good night's sleep. Then, the next day at 10:00 we headed out for what became a five hour drive back to Ha Noi via Hai Phong harbor in rain that was so hard at times that you could hardly see the road. The trip included a stop at a pottery factory and two ferry crossings; we were obviously a bit of a novelty on the ferries where everybody had to stand beside their cars. So, by the time that we got back in Ha Noi, we were exhausted but not through. We had reservations for the water puppet show that evening, yet another of those must see things; in fact, I had seen a story about this theater several months earlier in a CNN travel segment. It's done in a small theater holding perhaps 200 people, mostly tourists and virtually all adults. At the front is a pond of murky water probably 20 feet square. The band starts and then puppets-boats, turtles, dragons, people, birds and a variety of other mythical characters-come out from behind a curtain into the main pond and basically dance and cavort to the music. There may be as many as a dozen puppets in the water at one time. The 15 acts are over in about an hour. Then, the puppeteers, 10 men and women, come out from behind the curtains to rousing applause. All in all, it's quite delightful. Some final comments. 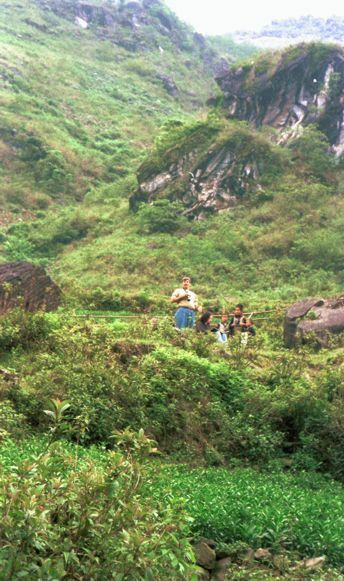 The people on the Sa Pa trip were not casual travelers; they all looked very comfortable with the environs. And a number of them had young children. On the other hand, with a little planning, and a good tour operator to take care of the details, it was not a hard trip and it certainly was not an expensive trip. You were not supposed to drink the water at any time but not getting water in your mouth while showering or washing your face is nearly impossible. We also drank bottled water or iced-tea given to us with ice in it at several places without thinking; kind of self defeating. 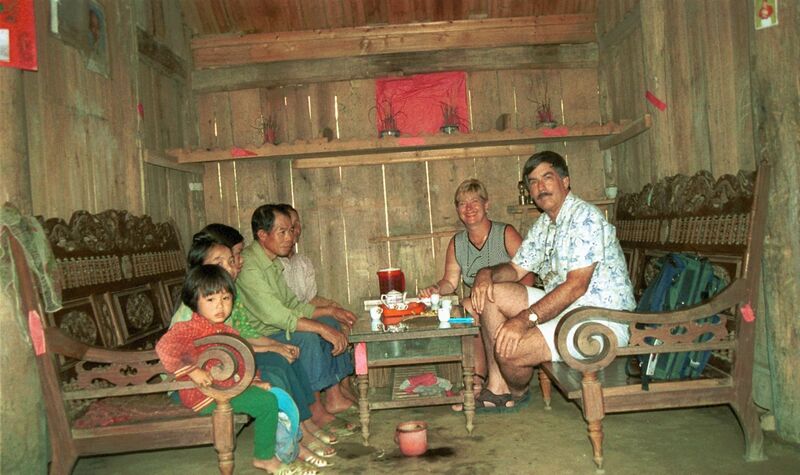 We drank tea at several minority houses along with rice wine and wine still fermenting. It was impossible to turn down. Yet we only suffered a mild case of Ho Chi Min's revenge at the end of the trip. So much for observing good health practices. We never encountered any mosquitoes, which is fortuitous because you can catch some bad diseases from them. Coolie hats and pith helmets were the head coverings of choice. Smog was quite noticeable in both Ha Noi and Lao Cai, but it was tolerable. Karaoke, the Japanese bar where individuals, after consuming considerable amounts of alcohol, stand up and sing along with music, were everywhere; the Vietnamese have clearly embraced this form of entertainment. My size in shirts worked out to be XXXL and, if it was cotton, was still unlikely to fit after it was washed. One of the problems of buying things in Vietnam was converting the price of something in Dong, their currency, to dollars. It was going at around 14,000 Dong per dollar, so something costing one million Dong was not that bad. Fortunately, they accepted dollars as readily as Dong.